Join TV’s Funniest New Family and flashback to the 90’s! 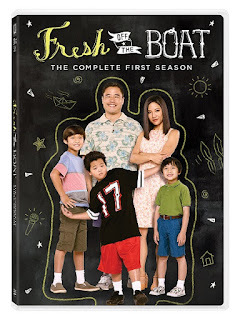 12-year old hip-hop enthusiast Eddie Huang (Hudson Yang) and his family make their way from D.C.’s Chinatown to Orlando where his dad, Louis (Randall Park) tries to make his new steakhouse a success. His mom, Jessica (Constance Wu) aims to understand the culture clash and dominate suburbia. While his brothers fit right in, Eddie’s still tries to get a seat at the table – any table – in the school cafeteria. Bullies on the bus may get him down, but Eddie can bust a move and wield a fajita like nobody’s business! Go behind the scenes of this breakout sitcom inspired by renowned Chef Eddie Huang’s bestselling novel. No, I haven't but it sounds like it would be very funny.